It's the season of falling leaves, pumpkins and thankfulness. And Jodi Kerr is thankful. She's thankful for a community that has supported her growing Meandering Maker business. So, to celebrate her first anniversary in business, she's starting the Prineville Thankful Campaign. Last fall, Jodi, who works as a substitute teacher, and her husband, Jeff, an engineer, started their woodcrafting business. They have a mobile craft trailer and do private parties in people's homes, at restaurants or other places. Their hosts invite their friends to meander over and make crafts. The Kerrs bring customizable craft projects to the host, and the guests paint their own personalized sign or other woodcraft project. Jodi says it's a way to get people out into the community and get creative and give a draw for local businesses. "I'm an OSU Cascades graduate who finished my degree at an old age, and I love facilitation, so I opted to do this," Jodi explained. "I moved to Prineville, and Prineville has been a great place to play and do this. So I'm thankful for this, so I wanted to showcase November gratitude." Jodi and Jeff will host a Prineville-Crook County Chamber of Commerce After Hours event from 5:30 to 7 p.m. Thursday, Nov. 1 at Tightwads Discount Building Supply. Only chamber members are invited to the event, where they will not only be treated to food, drinks and networking opportunities, they'll also get to try their hand at creating a "Prineville Thankful" decorative wooden sign. "I'm celebrating my one year anniversary, and I wanted to do something that would show the business community what I do, but it would be interactive," Jodi explained. "My hope is they'll put them outside their businesses." She has set up a corresponding Prineville Thankful Facebook page, where business owners and customers are welcome to visit and share what they're thankful for in Prineville. 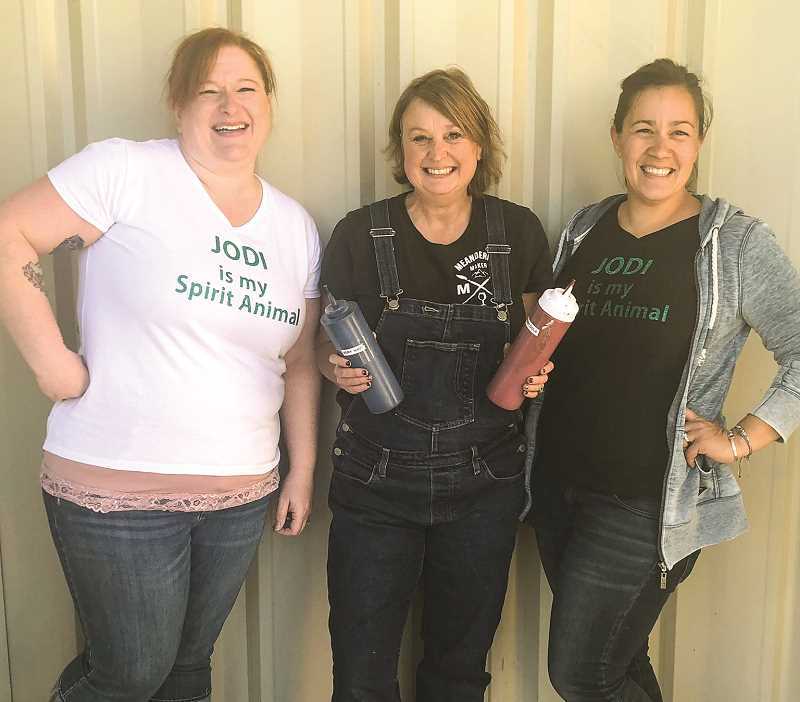 "It's a way for me to show them what I do, show my gratitude to the community, and celebrate my one year," Jodi said of the Prineville Thankful Campaign. "This will be fun to show everybody who hasn't been to a party what I do." Jodi has also been able to show some Crook County Middle School students what she does. 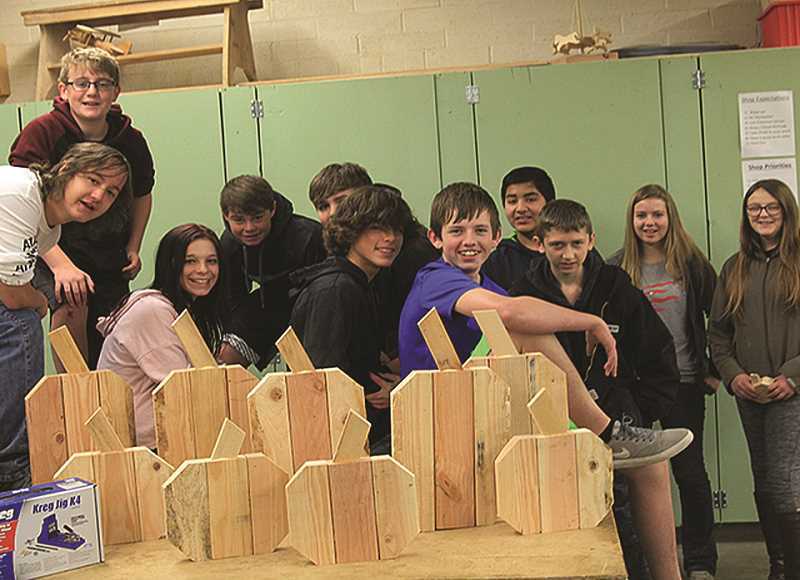 Earlier this month, she spoke to woodshop students in Jim Crouch's class. She told students about her woodcraft business and how she uses basic woodworking skills to make products for her craft parties. She showed students how to make wooden decorative pumpkins for the fall season and donated a Kreg Jig tool to the woodshop so that students can make some of their own. "They built them in two days and had a lot of fun," Jodi said. The goal of her Prineville Thankful Campaign is to create a presence of gratitude. "We have so much to be thankful for in Prineville. We've been able to grow and maintain our presence in the community," Jodi said of her business. "We're just really a cool town."